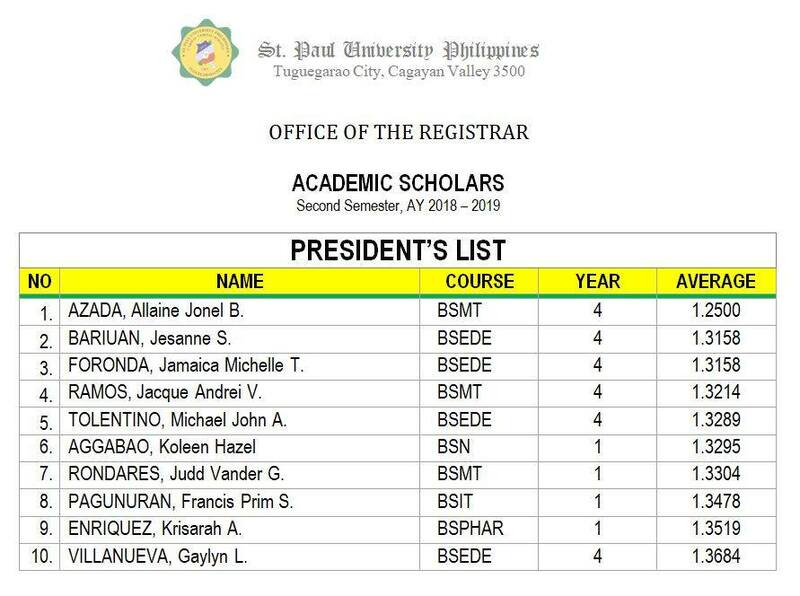 April 10, 2019 - The Office of the University Registrar has published the list of Academic Scholars for the Second Semester of the Academic Year, 2018 – 2019. Mr. Allaine Jonel Azada (BSMT 4) led the honor roll by garnering an average of 1.2500. For this semester, there were 24 students in the President’s List, while 113 in the Dean’s List. Students in the President’s List are accorded 100% Tuition Fee Discount; while, 50% for those who are in the Dean’s List. Moreover, the scholars’ weighted average is AUTOMATICALLY GENERATED by SPUP's Student Information and Accounting System (SIAS); then, VERIFIED and VALIDATED by the University Registrar.